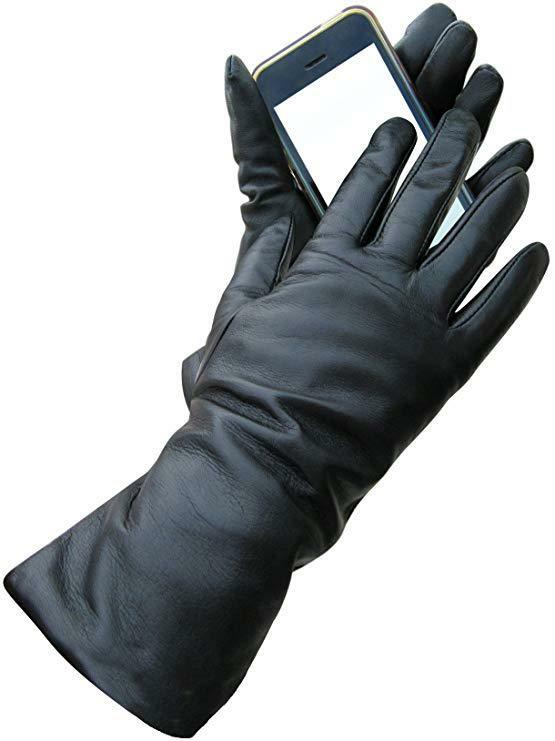 If you would like to use your cell phone, or any touchscreen device, without having to remove your gloves in winter weather, you are going to want to get yourself a pair of women’s touchscreen compatible gloves. Tech tip garments are not bulky, can be very warm and are stylish enough to wear to work or for commuting. The way touchscreen friendly designs work is that they have conductive materials (usually a metal thread like stainless steel or plated silver) sewn into the fingertips so that they can conduct the electric charge from your finger to the touchscreen. The best women’s winter touch sensitive gloves come from the same materials that you would find in regular winter styles like leather, wool or fleece and don’t particularly stand out and looking like tech designs, they look like normal, stylish, winter designs. Whether you need them for texting, taking photos or just using your phone in general, touchscreen-friendly gloves are a fantastic investment to keep you or a woman you love, cozy and warm in the winter. Isotoner make some of the best winter gloves, period. Most of their classic styles now come with touchscreen compatibility. The product pictured above is the newest version of the Isotoner’s heritage style which has been popular for years. This Isotoner design is excellent because it has a fleece lining, so they have a nice, cozy and warm feel to them. They also contain spandex material so that you can get a good fit and while still maintaining comfort. An advantage this Isotoner design has over other options is that it uses something called smartDRI® technology, making them waterproof so you will stay warm and dry even in the worst kind of wet, slushy conditions. One of the best things about this style that can be difficult to find in other designs is that they have a perfect grip because they have palm strips on the inner part of the hand. So not only is it easy to use your phone while wearing this design, but it is also easy to grip the phone, so it doesn’t slip out of your hands. The length is also nice and long, so your wrists won’t be exposed to the cold air. If you want a great style that you can dress up or down, that isn’t bulky, looks good, and that you can use your phone with, you should check out this great option from Isotoner. 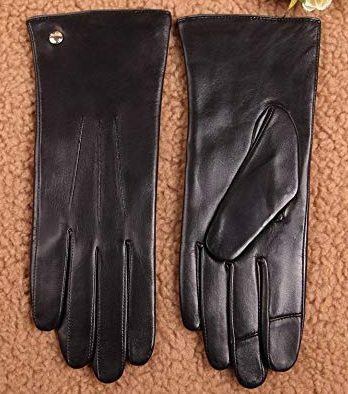 One of the most popular leather options with the conductive touchscreen that is available on Amazon is the Warmen Women’s Touchscreen Winter Nappa Leather Gloves. They come in 4 color options, and you can get them with either cashmere or a fleece lining, which are both reported very warm. 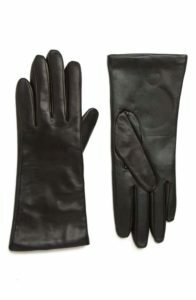 The leather is a lambskin leather that is very soft and supple. They also have a nice pleat and button detail on the cuff to give them a little bit of style. What is also interesting about this style is that they come beautifully packaged, so they feel very luxurious when you are taking them out of the box. Partly due to the packages and the overall luxurious feel to this design they make a great gift since they feel like a much more expensive product than they are. Overall the reviews are very positive for this Warmen style, and most women seem to agree that they are a well-made product for the price. 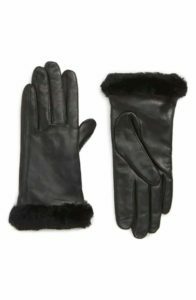 A classic option from Macy’s that women are having a lot of success with is the Charter Club Micro Faux Fur Lined Leather Tech Gloves. They are leather lined with faux fur, so they are toasty and warm. The tech tip reportedly works very well, which means you rarely have to remove these gloves to use your phone. 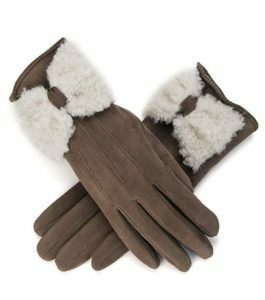 If you are a fan of UGGs, you are going to want to check out their UGG Touchscreen Compatible Leather Gloves with Genuine Shearling Trim. As with most of the UGG products, these gloves are pure comfort and warmth. They are on the pricier side, as is to be expected from UGG, but their products last for years and provide excellent quality, heat, and durability. This particular style has genuine shearling trim on the cuff as well as very soft leather with the touchscreen compatibility built-in. The shearling is only at the opening and is not part of the lining. The lining is mostly wool, with a bit of nylon and cashmere for softness. A well reviewed, budget option that is worth checking out if you don’t want to spend a lot of money is the Women’s Touch Screen from Dimore. 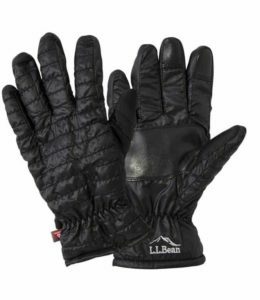 These gloves are lined with fleece with an outer flexible polyester material that is reportedly very comfortable and warm. The touchscreen element has been put on the index fingertips and also the thumbs, so it is easy to use your devices while wearing this style. 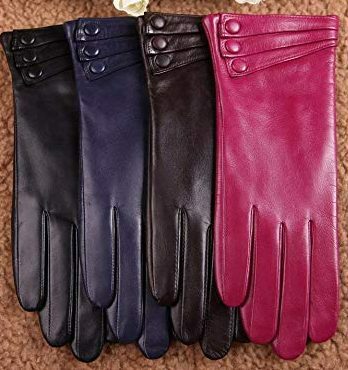 They come in three color options with slightly different decorative accents available, that makes a nice change if you are bored with standard gloves. One downside to this style is that they are one size fits all, so if your hand size falls outside standard sizing, they may not be the best option for you. However, they are stretchy so the stretch should accommodate most women hands adequately. While this design is warm enough for mild to moderately cold weather, they won’t work well in extremely cold or wet conditions as they are not waterproof, but are fine for running errands, driving and commuting. A brand that has been around for over 230 years that makes fantastic 100% leather gloves are Fownes Brothers. These days they are doing great stuff with their conductive leather technology, and you can usually find them at most department stores. They have a few different leather options for women that are warm and durable. 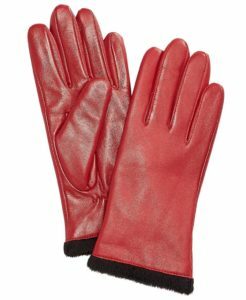 We have chosen the longer length Cashmere Lined Lambskin Leather Gloves as one of the best options for touchscreen friendly designs. This style is excellent as it has a 4-button length, so you don’t have to worry about your wrists getting cold. It comes in either a 10″ or a 12″ style, so they are quite long. Fownes leather is known for being super soft and supple, making them comfortable to wear with a good grip on them. They come in a fantastic range of sizes, but if you are ordering online, you need to make sure you measure your hand correctly. Due to their range of sizing, this style is an excellent option if you are someone who has trouble finding leather options that fit correctly, especially those who have long fingers. The lining is 100% cashmere so they will be warm, soft, and comfortable to wear. The smart tips on index finger and thumb will work well on tablets and most phones. Another top quality design is the Nordstrom house brand Cashmere Lined Leather Touchscreen Gloves. 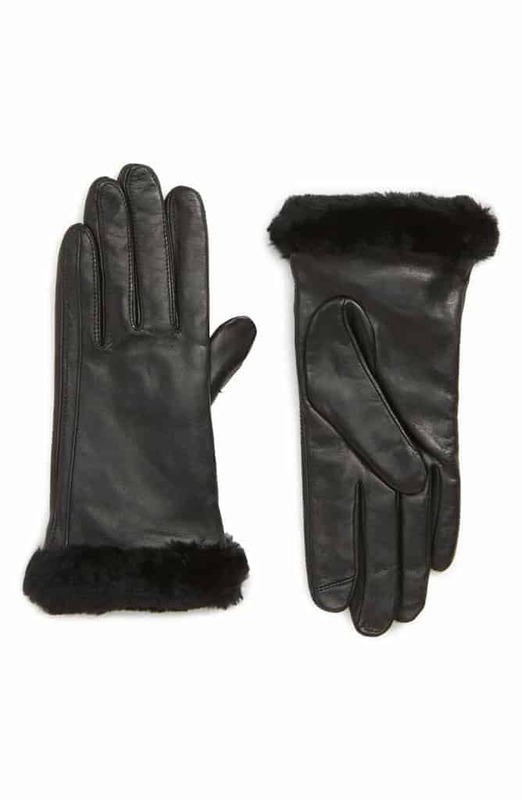 These are your basic, stylish, leather design with a soft cashmere lining. They have touchscreen compatible fingertips, so they are another good option for winter wear. 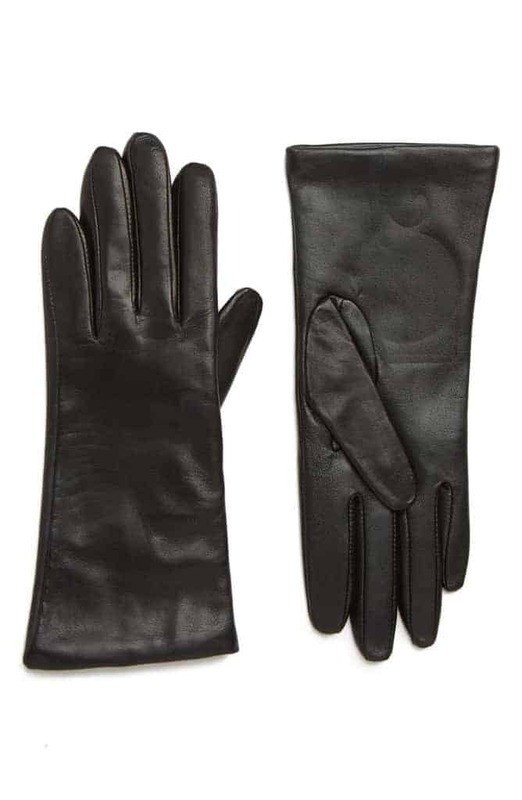 The leather is very smooth, and the cashmere is light and comfy, yet still warm. They are a reliable, durable option if you are looking for a basic leather style. 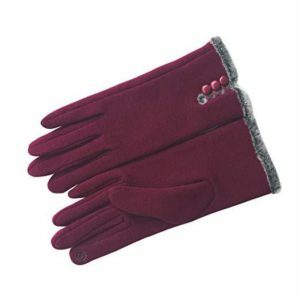 If you prefer a fabric style that you can use with your phone, you may want to take a look at the T-GOTING Women’s Touch Screen Gloves. They are reportedly super soft, comfortable and reasonably warm (but not for extreme cold weather). The lining is 30% cotton 70% polyester, so they are straightforward to clean, although they aren’t waterproof. They have touchscreen capability on the thumb and the forefinger. They are one size fits all, but since they are fabric, there is a little bit of room to stretch in them and will fit most women adequately. They come in over ten colors, and most reviewers feel they are good quality for the price. For those who are familiar with the Smartwool brand, you may want to check out their liner options that are touchscreen friendly. You can wear this style on its own for mild to moderately cold weather or as a liner with another pair of gloves for more extreme weather. They are a lightweight knit made from mostly Merino Wool and Acrylic materials. 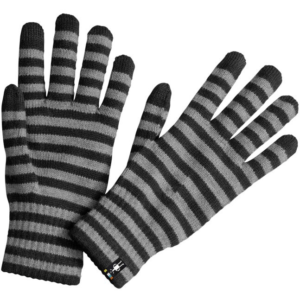 They are a cute striped pattern and are easy to fit into your pocket for any cold weather emergencies. L.L Bean is always an excellent brand for high-quality winter wear. A warm, ultralight option that they offer that is very popular is the PrimaLoft Packaway Gloves. They contain 60-gram insulation and use the Aerogel technology that NASA developed to make insulation warm, but also very light and comfortable to wear. This style works well in wind and light rain(they aren’t fully waterproof) and is, of course, touchscreen compatible. What most women love about this design is the lack of bulk for quite a warm style. They also look great and can be worn with a lot of different types of coats, although they are more sporty looking than other brands on this list. The other great thing about this style is that compress to fit easily, so they don’t take up a lot of room in your coat pockets or if you need to pack them for travel. The only downside is that they are a little bit short on the cuff so your wrist might get cold. 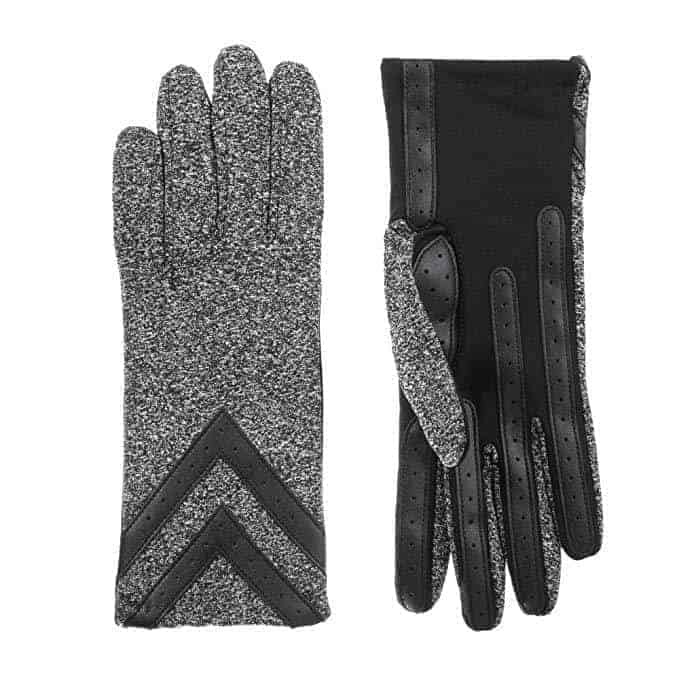 Finally, our last selection is the Elma Classic Touchscreen Leather Gloves. These are another favorite, inexpensive option that gets good ratings on Amazon. They have the conductive fingertips on the thumb, index, and middle finger that work quite well. 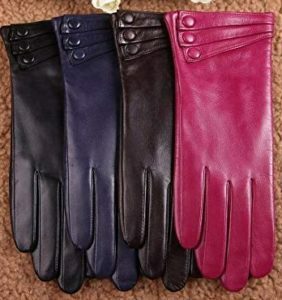 The lining is 100% pure cashmere, and the leather is reportedly very soft and good quality. It comes nicely packaged, and most reviews indicate that these are quite a luxurious product that is well worth the price. Size– If any gloves you are interested in are available in different sizes, it is worth taking the time to measure your hands. To measure your hands all you have to do is find a tape measure and place it around the circumference of your hand, which is around the fullest part of your knuckles excluding the thumb. Take that measurement in inches, and that is your glove size. Grip – While most designs do an excellent job at keeping your hands warm, often they don’t have a good grasp. Since you are looking for a style that you can wear while using your phone, you are going to want to ensure that any product you select has a good grip so you can avoid dropping your device. Wool styles are cheaper than leather, but usually, don’t have the best grasp with a phone. Leather typically has a decent grip or look for options that specifically say they have a good grip. Warmth-If you are looking for winter gloves, the level of warmth that the design provide is going to be a huge consideration. Leather can be a warm option if it has a warm lining like cashmere. Most of the products that we feature in this post are dressy and intended for shorter periods outside, or mild to moderate winter conditions. If you are looking for a design that is good for extreme conditions, you will probably want to look at ski glove styles which are beyond the scope of this post. Lining– You can get many different types of lining, some popular options are cashmere, wool, and fleece. Cashmere will be warm but will cost more than a product with a fleece or a wool lining. The polyester lining can keep you hot, but potentially not as soft as other types of lining.